The Museum of the University of St Andrews has an exhibition currently called “Victorian Visions”, looking at 19th century items in their collections, and with a focus on the rediscovery and restoration of the medieval heritage of St Andrews. When they asked me if I could come in and do a concert of medieval harp music to tie in with the exhibition, I started thinking of musical parallels to this rediscovery. Patrick Byrne is an obvious starting point, as he was in Scotland in 1845. The famous description of his performance of Brian Boru’s March has been realised a couple of times before, by Ann Heymann and by Chad MacAnally, but this is an obvious one to do as it tells the story of the battle of Clontarf in 1014. I have been hunting for earlier settings of this tune but I’m finding no mention of it before the early 19th century. But from then on it became a bit of a staple of the harp tradition both in decline and in revival. 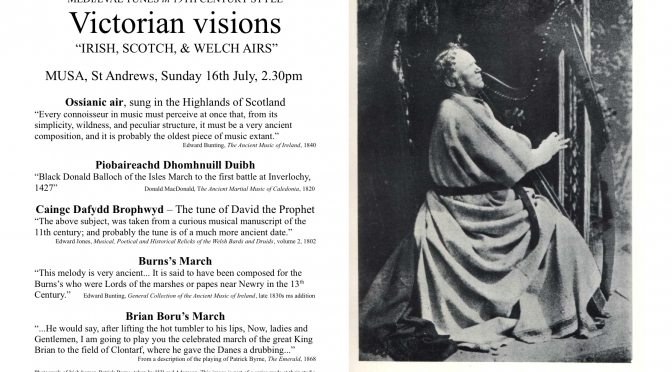 Patrick Byrne advertised on his concert poster “Irish Scotch & Welch airs” so I tried to find examples of each. For the Welsh tune, I thought immediately of Cainc Dafydd Broffwyd, from the 17th century Robert ap Huw manuscript, but which was published and arranged by Edward Jones in 1802. Once I started getting to grips with the fantastically lush and florid Welsh harp variations in this print, I found they worked very well on the big Irish harp. For Scottish tunes the choice was less clear. I had thought of Hey Tuti Teti, for the battle of Bannockburn, but I couldn’t find a good 19th century setting. Scottish collectors seem to have been too minimalist and scholarly. Instead, I chose one of the pibrochs printed in piano arrangement by Donald MacDonald in 1820. My selection tends to the earlier end of the 19th century which is not really Victorian but I felt that I could stretch the boundaries a bit to tell a good story and get a good programme up and running. I am planning to try videoing each concert so hopefully there will be something for you to see and hear if you can’t make any of the actual events. I have two concerts in Dundee before the Museum one in St Andrews so I will have a chance to try out the programme a couple of times. Friday 30th June 2017, 1.20pm. Wednesday 5th July 2017, 1.15pm. Sunday 16th July 2017, 2.30pm.